Try Graph in Email in your inbox. Your message was sent successfully. Please check email for Graph Sample. Interactive graphs prove to be very beneficial for companies who wish to display their information in a visually rich manner, thereby enhancing your company’s credibility. Research companies can share varied data and findings that they possess. Manufacturing companies can share their annual reports with their shareholders. Educational institutes can show their previous student achievements and placement records. Food and Beverage companies can easily compare their ingredients or nutrients with their competitors. E-commerce websites can compare the features and specifications of various products. Interactive graphs are compatible with most of the platforms. Outlook and Lotus are two platforms where you can read the graphs, but animation might not be displayed. 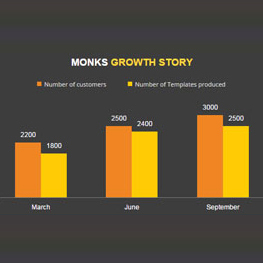 If you wish Monks to build your Email Template using Graphs.